On this week’s episode of F&I Today, Becky Chernek goes over the importance of visuals in your presentation and how you can use video, pictures, and graphics to get your point across to the customer. Welcome to F&I Today I’m your host Becky Chernek. Today we’re going to discuss, why visuals do an amazing job increasing product sales! If you’ve ever attended a workshop, you’ll know that every facilitator uses visuals to express an idea! Did you ever ask yourself why? Because it would make for one boring workshop if they didn’t. In fact, it would be more like a lecture than a workshop, and you’d be bored to tears! Ever wonder why workbooks or manuals show more pictures today than words? It’s all about engagement! Just like the saying goes: a picture is worth a thousand words! At this point, I have to ask you: Why don’t you use more visuals to get your point across to the customer? I can’t begin to tell you how many times I’ve gone into a dealership and pull deals, only to seldom find any visuals in the deal jacket. When I sit with the F&I manager and ask them to overcome an objection, they may come up with an okay response, but it’s boring as hell. And when I ask them why they don’t use more visuals, they look at me like I’m crazy! The fact remains, some of the best the most successful F&I people in the industry use visuals to bring value to their ideas. Think about it. Why is Pinterest so successful, or Instagram? People love to share stories with their photos! And so it stands to reason that when selling a story to a customer, you could do increasingly better by following that clue. When you discuss an idea with your customer, become a storyteller and use visuals. Engage the customer on all levels with bright ideas that bring value to the point you want to enhance, using visuals that are short, sweet, and to the point. No matter the idea, I want to bring home I use a visual. Over the years, I’ve often trained on the importance of utilizing visuals to stress the importance of gap insurance without selling it. I want the customer to understand the benefit behind gap without being overbearing. I like to explain how gap works. Believe it or not, many customers still don’t understand what gap does. In a situation like this, it’s not a good time to assume they have a full understanding of how it works. I once facilitated a workshop where an F&I manager from a high-line store told me she wasn’t comfortable talking gap since she didn’t see the benefit in the product. The bottom line was, even the F&I manager didn’t understand what gap did. Everyone assumed she did, so no one bothered to walk her through it. When I broke down how gap works in an easy to use format and using visuals, that F&I manager immediately understood the benefit. Sometimes, we think it’s best to outsmart someone to make a sale, when in fact keeping it simple is the best method! KISS it! You can imagine what happened next: the entire class was dumbfounded, proving my point that using visuals works. Bear in mind that just because you know something and see it every day doesn’t mean that everyone else does! A quick visual explaining the benefits of gap works. Plus, it may keep the customer from zoning out on you as you present all the products on the menu. In my experience, F&I managers who use gap visuals have increased gap penetration to as much as 70-80 percent. Visuals make a difference. Gap isn’t the only area where visuals have had great beneficial impact. Tire and wheel protection has increased substantially due to the use visuals that show the customer what a tire looked like years ago versus what it looks like today, and what can happen when they hit into a pot hole board or nail in the road and look we now have new coverages for cosmetic rim repair. It’s not overly complicated, and I will tell you, it’s not rocket science! Why an F&I person wouldn’t equip themselves with great effective visuals to make a point mystifies me. No wonder product penetration at some dealerships is average at best! An F&I person is still a sales person. They are an educator, and their job is to make sure their customers understand the benefit of every product offered and how they bring value. Some ask me if it’s okay to just show the customer a brochure. I don’t like to do that, for several reasons. First of all, it’s a bit lazy. Handing someone a brochure and expecting it to do all the work by engaging the customer is no way to win someone’s trust. I also think brochures open up the likelihood the customer will back up on you by saying they’ll review the brochure and get back to you. Don’t give the customer a reason to back out. Instead, be engaging. Bring out paper and pen and explain the benefits of the products. It will bring much more interest than just an oral conversation. The customer will actually understand what you are talking about if you take a more involved and interactive approach. Retention of content is key. If information is important enough to present to your customers, it is important enough to remember. Unfortunately, much of what is communicated orally is forgotten after a relatively short period of time. 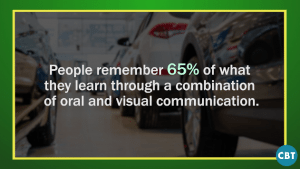 According to the U.S. Department of Labor, people remember 65 percent of what they learn through a combination of oral and visual communication. Verbal communication usually results in only 10 percent retention of information, and pure visuals result in 35 percent. Consider this, and ensure that your content is interesting and makes it worth taking into consideration. Go through all of your products and figure out the most frequent objections you get. Write out a word track that answers those objections, but include a visual that brings it home. For example, a customer may tell you they didn’t take advantage of a service contract because a consumer advocate told them vehicles are more dependable today than ever before. Therefore, they think they don’t need a service contract. In this case, I wouldn’t tell the customer that the reason we have 10 service bays in the back is because our vehicles break down all the time. Instead, I agree with the customer that our vehicles are much more dependable than ever before. Then, I grab a piece of paper or you use can your IPad and write out the word “Dependable.” Customers will never argue with their own logic, and they’ll be happy you agreed with them. But then I go on to explain how much more complex vehicles are today. I write down the word “Complex.” Before long, they begin to see the picture. I remind the customer that years ago, you could pop open the hood of a car and look down and see your feet. Today, you can’t. Vehicles are far more complex now that they have more components and electronics. I tell the customer that labor time is more intensive than ever before, and write out the word “Labor.” I inform them that these days, dealers have to hire experienced technicians with more school time than I have. Next, I write down the word “Waste” and tell them that in the old days, dealers used to dispose of waste in a black hole behind the lot—but that with today’s regulations, dealers have no choice but to add the cost of waste disposal to the bill and that is adding up. Then, I sum it all up. Yes, vehicles are much more dependable today than at any other time in history, but if you happen to bring your car into the shop, it’s going to cost you more than it ever did before. That’s why many of my customers see value in the service contract—it’s better to have it and not need it than need it and not have it. Bingo! I’ve just created a visual that customers understand and realize the impact of not taking advantage of the service contract. No smoke tricks, it’s all real – I hit home where it matters. When you use visuals, you give yourself the opportunity to discuss the value of the product in conjunction with the point you want to deliver. It all goes hand in hand. This takes work. You have to plan and practice to become proficient with combining words and visuals, but in the end, I promise it will make an enormous difference in performance. Before long, you will be the envy of your dealers 20 Group and taking home paychecks you’ve only dreamed about! Thank you for joining me on F&I Today. Be sure to come back next week right here on the CBT Automotive Network for our next edition of F&I Today. Contact me regarding my consulting services, my specialty is helping auto dealers achieve high levels of performance and profit by improving internal processes that begin the moment customer touches down on the dealership website and end with finalizing in-person transactions in F&I. My techniques are proven and make for a serious impact in your overall performance. Let’s discuss my online “free” analysis with no obligation! What you will learn will save your millions of dollars in lost revenue! My in-dealership training is guaranteed or your money back if not completely satisfied– travel is not included! Contact me today to learn more.